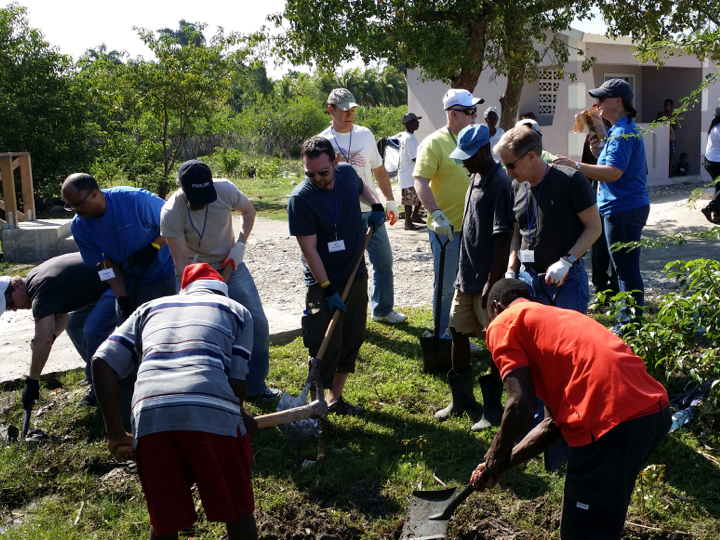 Earlier this year, eleven staff members from across our Innovairre family participated in “A Journey of Hope to Haiti,” sponsored by our long-time nonprofit partner, Food for the Poor. Along with eleven other people from across the US, our mission group of 22 would “live” this eye-opening, sometimes heart-breaking experience over the course of the week. Upon arrival in Haiti, we immediately traveled to Cite Soleil, the largest and most dangerous slum in the western hemisphere, where over 350,000 people live in shacks made of refuse and discarded materials. The severity of security concerns in Haiti was made starkly evident to us when we traveled along densely crowded, ramshackle roads riddled with potholes, rocks, and trash. Our first stop was Ecole Notre Dame du Perpetuel, a school funded and operated by Food for the Poor, providing a safe, affirming educational environment for 600 children in pre-K thru grade 6, whose families live in Cite Soleil. The children gathered by grades in their schoolyard, sang songs for us, and eagerly awaited the school supplies, candies, small toys, and other gifts our group had brought to share with them. They enthusiastically embraced us and energetically engaged us in their recess. Despite the different languages spoken, the universal language of love was our primary means of communication. Next we set off for Port-au-Prince and the opportunity to assist in a Food for the Poor feeding program that provides meals to 12,000 people each day. Crowds begin gathering at dawn, some people walking for 2 hours, and then waiting in line up to 3 hours, to receive two small plastic buckets of food―for most, the only food their family will eat that day. Our hearts were touched as we packed scoops filled with rice & beans and placed ladles full of chicken vegetable soup into the buckets of those desperately waiting. Some begged for more. But there were so many waiting in line behind them! At Bernard Mevs Hospital, which served 80,000 patients last year, and where Food for the Poor supports the only neonatal intensive care unit in the entire country, as well as the pediatric unit, we visited with the children and their families. As rudimentary and sparse as conditions are in this hospital, it’s the best medical assistance available, aided by the volunteer services of doctors and nurses visiting in shifts from other countries to serve the sick and train the Haitian staff. Concluding our first day we visited the FSUD Children’s Home, a school serving 200 students, nearly half of them abandoned kids from the streets, brought in by neighbors, orphaned by the earthquake and by disease. The conditions there were difficult and the children more withdrawn, less engaged than those we interacted with at Cite Soleil. But generosity ruled the day! They perked up and welcomed the suitcases full of gifts our group had brought for them. Boys jumped at the chance to play with soccer balls. Girls delighted with coloring books and crayons. The youngest oohed and aahed as we showered them with bubbles. The next day, we traveled for 1-1/2 hours, passing countless tent-cities, where 4 years after the earthquake families still rely on duct-taped, patched tarps and canvas structures for a roof over their heads. Our trip was over bumpy, congested roads, careful not to collide with the infamous Tat-tats, the Haitian open pickup trucks, broken-down vans, and obsolete buses that function as the only mass transit. We reached Four-a-Chaux, near the epicenter of the earthquake. Here, where Food for the Poor has built and donated new homes to 25 families, each with the gift of a resident goat, some of us dug a canal/drainage ditch to alleviate flooding, while others planted coconut trees. Nearly the entire village gathered to pray, welcome us, express their gratitude, join with us in our manual labors, and wish us well when we left. The rest of that day was spent painting a new house, constructed by FFP and donated to a poor Hatian family. Our group was ready! What skill and precision, as we split up into outdoor and indoor teams, creating a wonder in the color purple! Not only did a homeless family now have a bright, cheerful residence when we finished, but over the course of our hours there, children began appearing from all sides, and in between our paint brushing and rolling, we offered gifts, candies, hugs, and hope to everyone who gathered. Our final full day in Haiti pulled at our heartstrings again as we journeyed to a home for the abandoned elderly: 350 one-room houses, built in blocks of eight to ten, connected by central sidewalks. We were greeted by the Korean Catholic Sisters who staff this facility, built by Food for the Poor. Our teams spread out to bathe the sick, sweep and mop the floors of their small houses, and assist with other chores. Later, all the residents who could walk gathered in an open-air pavilion, prayed, sang songs, and reveled in our company as we held their hands, danced with them, and witnessed their faces light up with joy, our hearts filled with gratitude that our presence there could mean so much. At Santo Farm, another FFP project specializing in improving agriculture and aquaculture in Haiti, we learned about the introduction of a new species of catfish, imported from Vietnam, which will provide the poor with an excellent source of nourishment, high in protein and easy to grow. These fish breed quickly in ponds, offering a good livelihood and source of support for fishing families. Our last mission project was the Little Children of Jesus Home, an orphanage for children with disabilities. Here once again we shared all we could . . . love, time, candies, toys, and gifts with the children, many confined to beds and cribs, unable to walk, talk, or function intellectually. We gently touched their faces, joined our hands with theirs, picked them up in our arms, and clearly saw how much this meant to them by their broad smiles and happy giggles. To a person, every one of us who participated shared how much we appreciated this opportunity to give and to serve. We are an Innovairre family of fundraisers, and now for many of us fundraising has a face . . . of a specific child, a hungry mother desperate to feed her family, a lonely, abandoned elderly person . . . and we are far better aware of our contribution as a company in assisting the nonprofits we serve to feed the poor, shelter the homeless, care for the sick, provide for orphaned children. This first-hand experience only renewed our commitment to offer our energies to our clients, who among other goals help make our world more loving, more caring, and more compassionate, especially for the most disadvantaged among us. Paul Daleo is SVP of Fundraising at Innovairre, which supports more than 500 nonprofit organizations around the world. To learn more about Innovairre and the work we do, contact us at Answers@Innovairre.com.